Fernando is partial to Awlgrip, and he uses just a brush – a $65 ox ear hair brush. 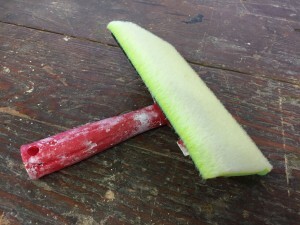 He doesn’t roll the paint on with a roller, then tip with a brush (the roll and tip method). After watching Fernando, I decided I would brush my topsides with Awlgrip. 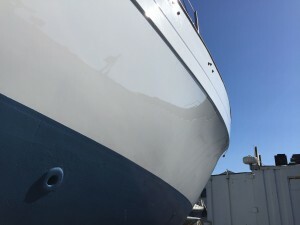 There are a few preliminaries: My boat was painted with two-part linear polyurethane fifteen years ago, so new two-part linear polyurethane (Awlgrip, Interlux’s Perfection, et al) can be painted over it without priming first. If you’re painting over gelcoat you have to prime first, adding several steps and many hours to the process. And if, God forbid, your boat has been painted with enamel or one-part linear polyurethane, it must all be removed. 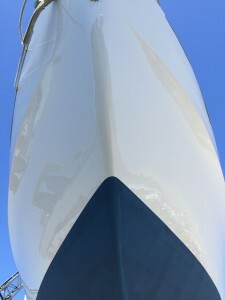 You can read my post about painting two-part over one-part, but might be riskier with topsides. For my boat I just had to sand it and make sure no wax or gook remained on the surface. I decided at the outset I was not going for a ten out of ten, in fact I limited myself to two applications of bog in the preparation. That is, in filling various scratches, dings, and gouges, I would fill them with an initial application of epoxy filler, sand them out, and if they needed a second application of filler, so be it, but that was it. You can spend weeks filling and fairing a hull if you’re going for perfection, and I wasn’t going for perfection. My boat has a hard chine in the bow, which transitions into a design feature farther aft, and this line provided a natural break in the topsides, so I removed hardware and chain plates, and painted above this line at the dock. Below this line I would paint in the yard. 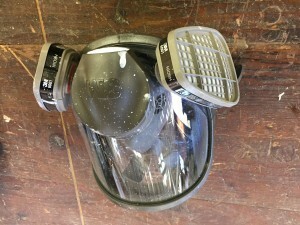 My filling and fairing went quickly, using West System, additives, and a vacuum sander. 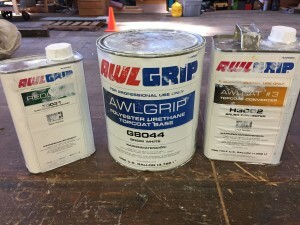 The Awlgrip paint, the catalyst, and the thinner. 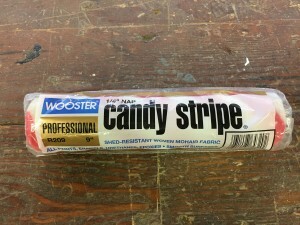 When my first coat dried it had lots of runs, sags, and curtains, which was disappointing. It’s all about the thinning, and Fernando seems to spend a lot of time futzing with thinner, to get the mixture just right. Awlgrip can be thinned 10-33%, but I was probably close to 10% on my first coat, meaning the paint was too thick, and thus prone to sags, runs, and curtains. But then came two pleasant surprises: First, Awlgrip sands like a dream. I’d say I sanded the entire topsides and transom of my 40-footer in two hours, using 400 grit on a Festool vacuum sander. 400 grit is quite fine, yet the sags, runs, and curtains melted away with just pass or two of the sander, leaving a perfectly smooth surface for my second coat. Awlgrip takes 14 days for a full cure. I’m guessing it will sand like a rock after 14 days, but the next day after painting it sands with ease, as in, totally painless, which has made me really like Awlgrip. The second pleasant surprise was that by not thinning enough and painting it on too thick I made a bit of a mess of it, but succeeded in getting a really thick coat of paint on. The coverage was already excellent, so I hoped to get away with just two coats, the minimum per manufacturer’s recommendations. There are a couple of runs, but nothing too unsightly, and they’ll shrink up a bit as the paint cures over time. There are none of what I’d describe as brush marks, but in the right light you can see some patterning between the 3-inch downward tipping strokes. 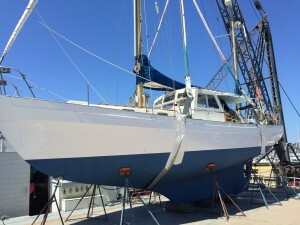 You’ll never scrutinize a paint job more than when you’re looking up at it in a boatyard. Once it’s in the water and crusted with salt, I’m sure the impression will just be ooh, new Awlgrip. Most importantly, I got very good results for about $400 in materials and about 25 hours of labor. 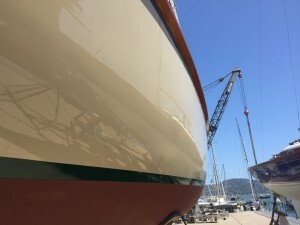 A sprayed Awgrip topside job on a 40-footer can run into the tens of thousands of dollars, depending on the amount of prep work. One Bay Area yard comes out of the gate quoting $1000 per foot. Let’s say, for argument’s sake, I saved $5000 or so over a sprayed job. With my two coats, the only time I was out over a spray job was the one sanding between coats, about two hours. And if I hadn’t been happy with that second coat, I would have just been out two hours of sanding and an hour of painting to get on a third. I had plenty of paint left over. With a spray job you’d do all the same prep work, then spray all the coats of paint in one go, over an hour or two. But with a spray job there’d be lots more masking, and probably pulling the masts to get the boat into an indoor painting facility. and we know estimates are always well below the final price. I did the roll and tip for $130 with primer and materials. Looked great from one boat length away.